A Lakeview townhouse graciously submitted to a remodel of its interior. 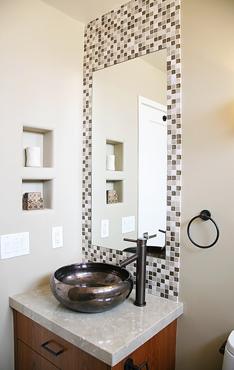 The master bathroom suite, guest bath and central fireplace are redesigned with ideas of universal design to be used regardless of age, ability and situation. Several layout options revealed the perfect solution that complemented and contrasted the many aspects of the existing spatial geometry, transforming the non-functional and elevating the mundane. 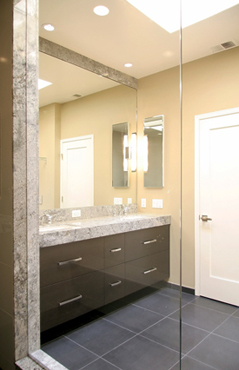 The underutilized master bathroom had several obstacles for the client in its functional use. Stripped down to the wall with new fixtures and layout, a nine foot long bench in the dual shower accommodates user behavior patterns, preferences and even client sketches. Metal offsets the tactile richness of wooden cabinets in bathrooms and firewood in fireplace, contrasting hard and soft materials against light colored walls.